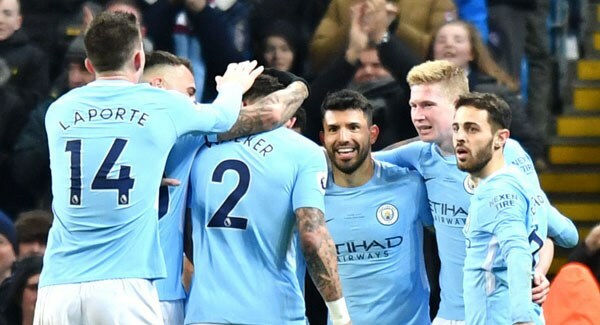 Sergio Aguero scored four goals as English Premier League leader Manchester City showed Riyad Mahrez what he was missing in a 5-1 thrashing of Leicester on Saturday. Aguero scored his goals in the second half, propelling City to a 16-point lead at the top of the standings. "He's an authentic legend of this club," City manager Pep Guardiola said. "Sergio is like this, he has a special talent in the box. He is clinical. We are so happy, we need his goals." Leicester striker Jamie Vardy cancelled out Raheem Sterling's early opener which saw Kevin De Bruyne provide one of his three assists. Mahrez returned as a substitute for Leicester after more than a week in self-imposed exile following the collapse of a move to City, but he could do little to stop Guardiola's rampant side. Sterling made immediate amends for a glaring miss last weekend. The England winger contrived to miss from three yards as City dropped two points at Burnley but this time made no mistake from a similar distance after just three minutes. De Bruyne curled in a dangerous low ball behind the defense and Sterling turned it home. From there it seemed City would assert full control while struggling to create clear-cut chances and giving Leicester a chance to level on the break in the 24th. As Vardy reached the edge of the area he connected with a firm shot and a slight deflection off new City defender Aymeric Laporte took it flying past Ederson for an equalizer. City responded with Bernardo Silva forcing Kasper Schmeichel into action and Fernandinho also shooting at the goalkeeper. De Bruyne brought an even better save out of him after cutting in from the left. City just needed to start applying the final touches and did so early in the second half, ruthlessly exposing Foxes boss Claude Puel's decision to switch from a back three to back four. De Bruyne was again at the heart of their good work, exchanging passes with Sterling and picking out Aguero at the far post for a simple tap-in in the 48th. De Bruyne set up another for Aguero just five minutes later, this time capitalizing on a poor clearance from Schmeichel to feed the Argentine forward. "We conceded the goals at a bad time, just at the beginning of the first half and just at the beginning of the second half," Puel said. "They killed the game in this moment. It's difficult to resist against this team. It's difficult to start and to get some possession against them." Aguero wrapped up victory with two more in the 77th and 90th. He first seized on another bad clearance by Schmeichel to chip home for his hat trick and thumped in a long-range shot off the bar in the last minute.